2010: This is a list of leopard subspecies. For completeness I have also included wildcats that have in their name the word “leopard” although these are different species of cat. e Red List. It was decided that this leopard is a subspecies from genetic analysis of a single cat. Overall population size of mature cats = less than 250. There are fragmented subpopulations of very small numbers (50). Habitat loss and fragmentation might be the biggest threats to survival in the wild. Its prey is hunted and it is killed by farmers in retaliation for killing livestock. These are common problems for nearly all the wildcats. The map shows the Dhofar mountains of southern Oman where the largest population is. Central Asia -- Panthera pardus saxicolor – genetics and appearance confirm this as a leopard subspecies. Its range is not fully understood. It is considered endangered by the Red List. Countries where is is found are: Iran, Afghanistan, Turkmenistan, Turkey, Armenia. This is not an all inclusive list. Population numbers are low, very low in some of these places (<10-13 in Armenia for example) and I am sure these are sometimes very rough estimates. a of occupancy) about 11,000 km² less than 15% of the country. The best location for this leopard subspecies habitat is thought to be Block I of Ruhuna (Yala) National Park (red pin on map) because if is well protected and there is a good prey base. 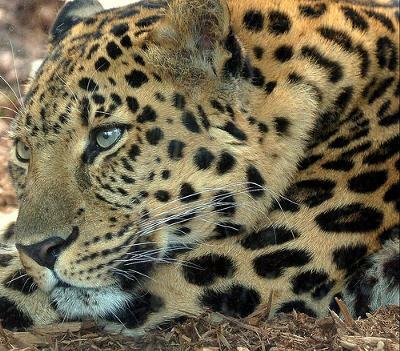 It is thought that there are over 800 leopards in Sri Lanka. The internal conflict with the Tamil Tigers may have impacted population numbers. Subpopulations are relatively small (below 250) and numbers are declining. Russian Far East, Korean peninsula & NE China -- Panthera pardus orientalis – this is the leopard subspecies called the Amur leopard. It is very rare with very low populations indeed. Southwestern Primorye region of Russia pop = 14-20 adults. Many threats, the usual culprits such as habitat loss and fragmentation, all man made. The population is declining and not surprisingly it is rated as “critically endangered” by the Red List. It is extinct in China and the Korea. The map marks the area of its habitat – south-western Primorye region of Russia. This is also part of the Siberian tiger habitat. Photo: creative commons - Attribution-Non-Commercial-No Derivative Works 2.0 Generic.